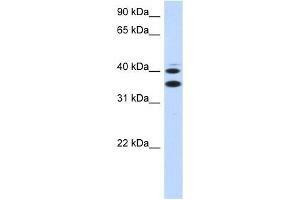 SLC25A32 antibody used at 1 ug/ml to detect target protein. Background SLC25A32 transports folate across the inner membranes of mitochondria. Folate metabolism is distributed between the cytosolic and mitochondrial compartments. SLC25A32 is a transporter that shuttles folates from the cytoplasm into mitochondria.